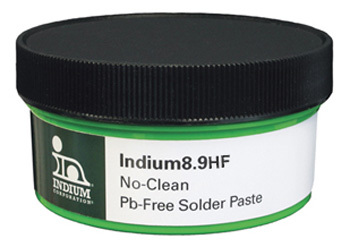 Indium8.9HF is an air reflow, no-clean solder paste specifically formulated to accommodate the higher processing temperatures required by the SnAgCu, SnAg, and other alloy systems favored by the electronics industry to replace conventional Pb-bearing solders. Indium8.9HF offers unprecedented stencil print transfer efficiency to work in the broadest range of processes. In addition, the high probe testability of Indium8.9HF minimizes false failures in ICT. It is one of our lowest voiding pastes.